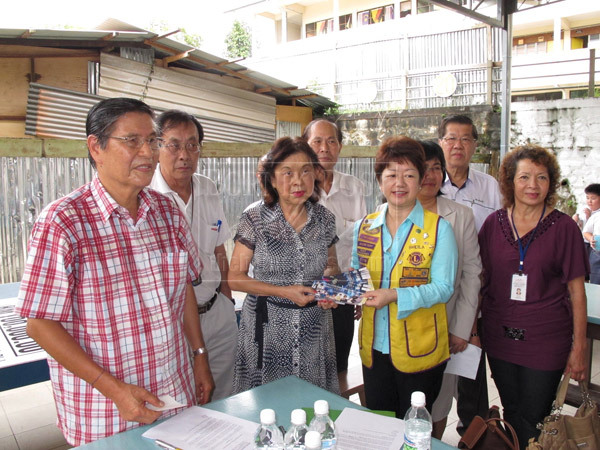 THANK YOU: Kho (fourth right), the secretary of the organising committee, presents the tickets to Tan (third left) in return for the donation made by MMS. Also seen is the management committee of Kuching Chung Hua Primary School No.1 to 6 chairman Dr Chou Chii Ming (left). KUCHING: The Astro All Stars Lions Club Charity Concert will be held from 6.30pm on Dec 9 at the State Indoor Stadium in Petra Jaya here. It is jointly organised by Astro, Kuching, Serian and Samarahan Lions Clubs, the Committee of Management of Kuching Chung Hua Primary School No.1 to 6 and Kuching Autistic Association. It hoped to raise RM1.5 million, where RM 1 million would be donated to the Committee of Management of Kuching Chung Hua School No. 1 to 6 for the four-storey new building of SJK Chung Hua No.1. While the RM500,000 would go to the Kuching Autistic Association for its new premises at Desa Wira, Batu Kawa. According to the organising chairman Michael Lim, they aim to raise RM1 million from the tickets sale while the rest would come from donations. “The major contributors will be from cash sponsorship or donations in kind, and will depend on the generosity of sponsors like you. We, therefore, appeal to you to donate generously towards helping these two meaningful projects which will benefit our community for many years to come,” said Lim in a press statement. He added that donors who contributed RM50,000 or more would be able to adopt a classroom in the new block of SJK Chung Hua No.1. “Your name or your nominee’s name will be affixed to the wall at the designated classroom to indicate your sponsorship. However, any amount less than RM50,000 will also be appreciated,” Lim urged. Audience at the concert would be entertained by Astro artistes such as the MY FM famous deejay, Ah Beng, and other well known award-winning artistes. The tickets are available at prices of RM30, RM50 and RM100 each. Contact Sheila Kho at 019-8867881, Tracy at 016-8663363 or Tan at 013-8011868 for the tickets. Alternatively, the tickets could be obtained from Flavours Restaurant at Jalan Song (082-460228), Porkies Restaurant at Jalan Song (082-456233), Compumart Sales & Services (Sarawak) Sdn Bhd, Sarberkas branch (082-456852) or One TJ branch (082-247737) or Bean Cottage at Jln Simpang Tiga (Jessie 016-8861688). Market Management Services Sdn Bhd (MMS) handed over RM100,000 donation to the organiser at a fund raising event last Monday. Its executive director Tan Soh Har said in the cheque presentation ceremony that MMS felt fortunate to be able to complement, support and work with local schools to promote good education among the youths, as good education was essential to prepare young people for the future. “Therefore, MMS is pleased to support this building at SJK Chung Hua No.1 with a donation of RM100,000 in memory of a former student, the late Wee Chiang Khoon, and a former teacher Eng Sai Luan, the parents of MMS chairman Raymond Wee Seng Bin,” explained Tan.